"This is my version of the classic chocolate fondant – but I like this name better. These little hot chocolate puddings really do remind me of volcanoes, as they release their soft, silky river of chocolate. Achieving this molten center is all about timing. Don’t let the puddings bake til the point that their surface begins to crack, as this means the centers are starting to cook. " - Paul Hollywood. This chocolate volcanoes recipe is Paul's interpretation of the signature challenge in the Desserts episode of Season 1 of The Great British Baking Show. It is explained in further detail by Paul in Season 1 Masterclass: Part 2. Grease six small pudding molds with butter and dust the insides with coco powder, then refrigerate for 30 minutes. Using an electric whisk, whisk the eggs, egg yolks and caster sugar together for several minutes until thick, pale moussey consistency. Then carefully fold the chocolate mixture into the egg and sugar mix. Finally fold in the 2 tablespoons of flour carefully so as not to knock any air out of the mix. Divide the chocolate mix between the 6 prepared molds. Place in the fridge until firm. You can make the puddings up to 24 hours in advance and leave them in the fridge until you are ready to cook them. Preheat the oven to 350F. 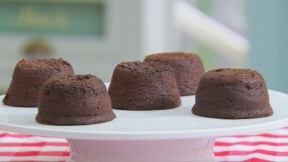 Place the puddings on a baking tray and bake for 8 minutes, or until the puddings are risen but not cracked. Turn out the puddings on to individual plates and serve, with pouring cream.